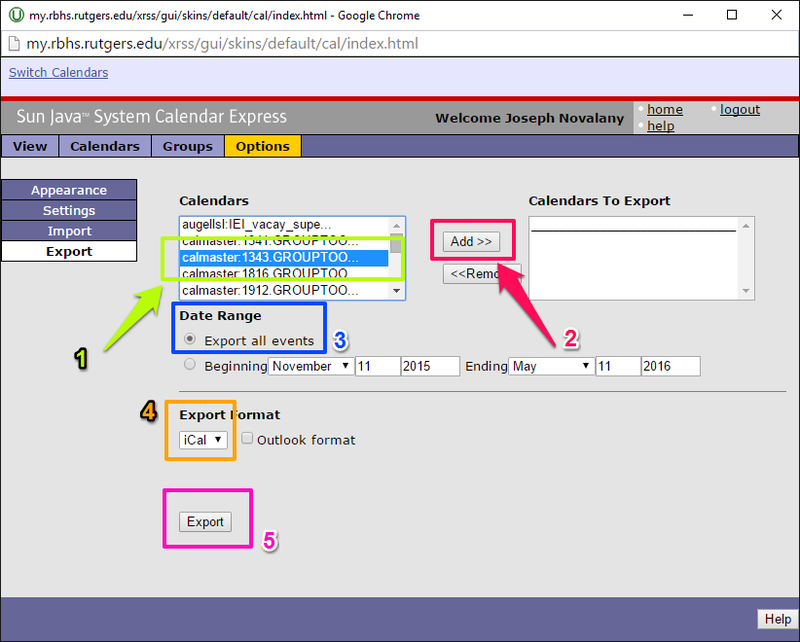 (Group Studio) How do I export the Group Studio calendar and import it into Sakai? Go to your RBHS portal calendar. A popup will appear (Note: if no popup displays then please ensure that any popup blockers are disabled and you allow popups via your browser configuration). 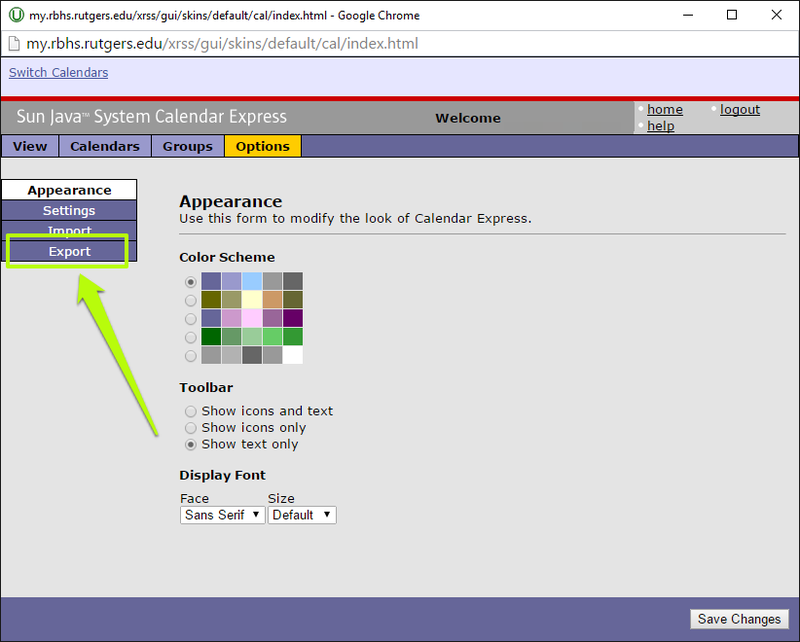 Choose the bottom calendar labeled “Sun Java Calendar Express”. 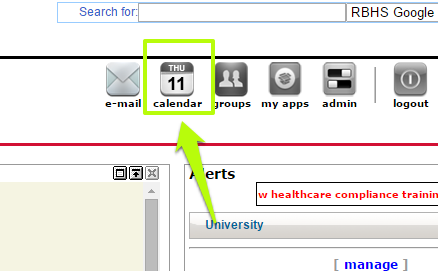 Click on the ‘Calendars’ item in the navigation bar at the top-left. 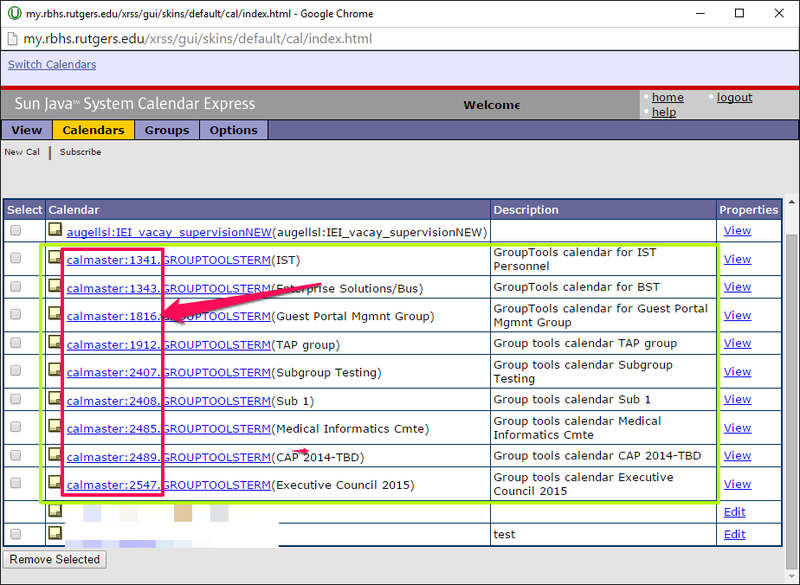 Find the Group Studio calendar(s) you wish to export and take note (e.g. write it down somewhere) of the ID number following “calmaster:” (i.e. 1241 would be the ID number for the calendar labeled calmaster:1241). Do this for each calendar you wish to export. 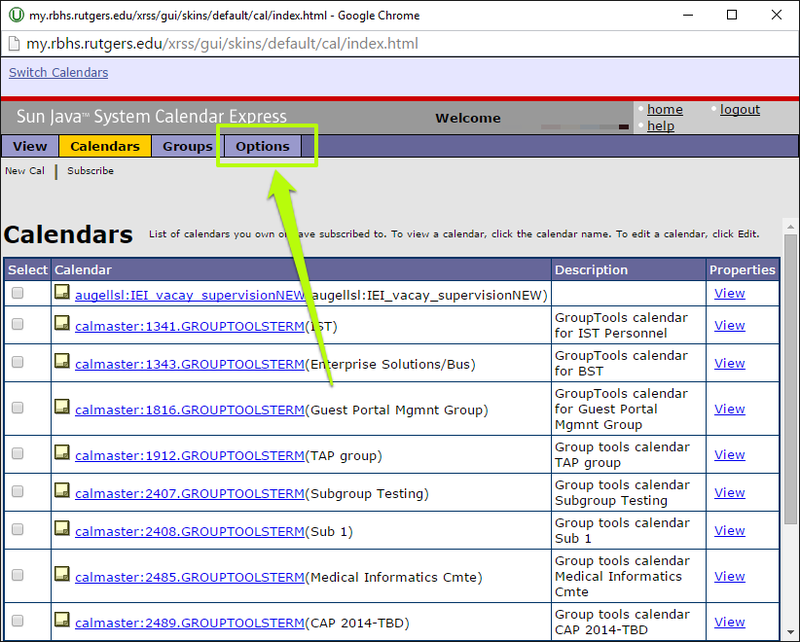 Click on the ‘Options’ item in the navigation bar — two items to the right of the previously clicked ‘Calendars’ item. Click on the ‘Export’ item in the side menu to the left. Note: Refer the example below for steps 7-11. Find the calendar in the list (denoted by the green arrow labeled #1) you wish to export using the ID number from step #4 above. 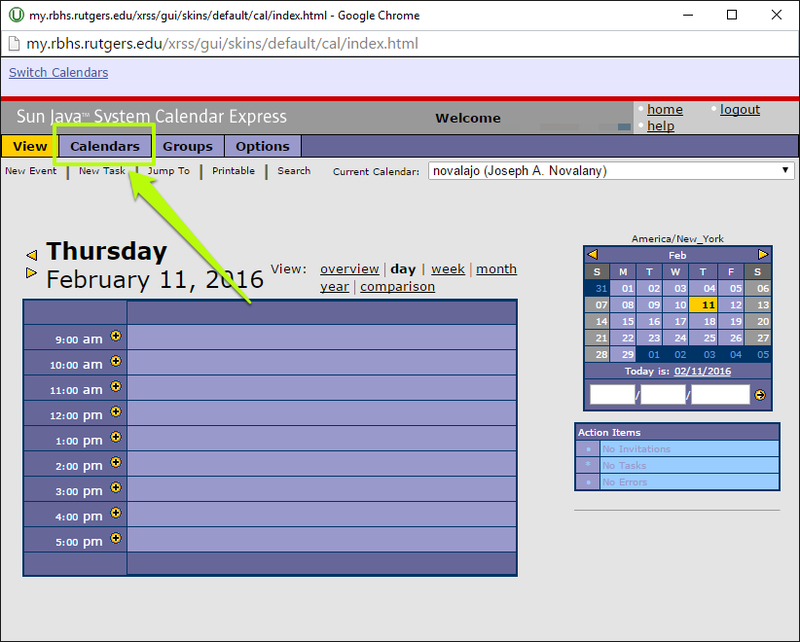 Select the calendar and click the “Add” button (denoted by the red/magenta arrow labeled #2). Select “Export all events” (recommended) or choose a date range to export (denoted by the blue arrow labeled #3). Ensure that “iCal” is the export format chosen (denoted by the orange arrow labeled #4). Click the “Export” button (denoted by the purple/hot pink arrow labeled #5). You will now be prompted to save a file. 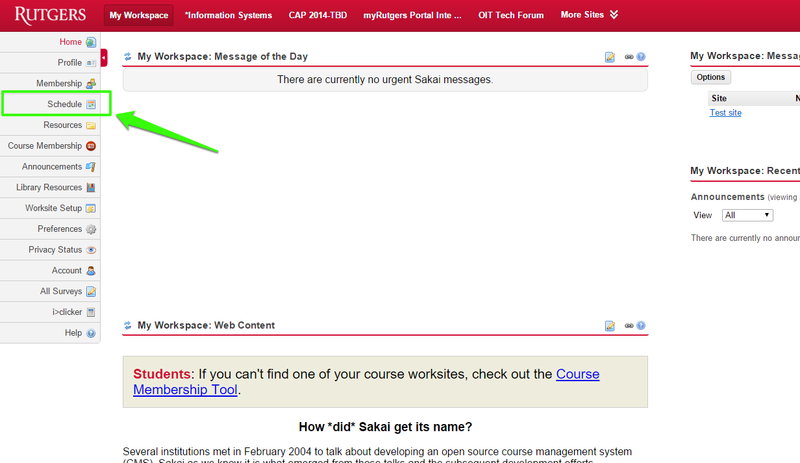 Select a location on your computer to store this file so that you can easily find it for when you are ready to import your group’s calendar into Sakai. Repeat steps 4-12 for each of your groups. 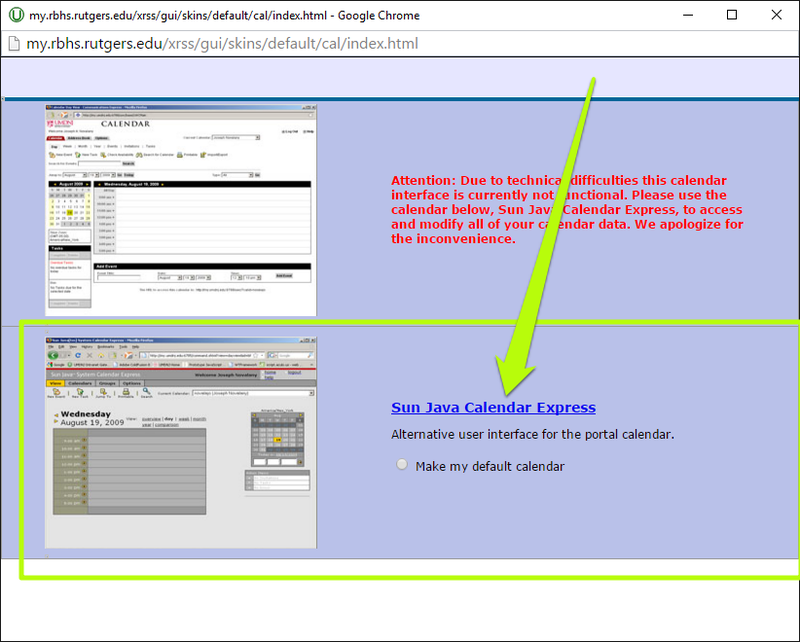 Go to the Sakai site you wish to import your calendar to. Go to the “Schedule” item in the left navigation menu. 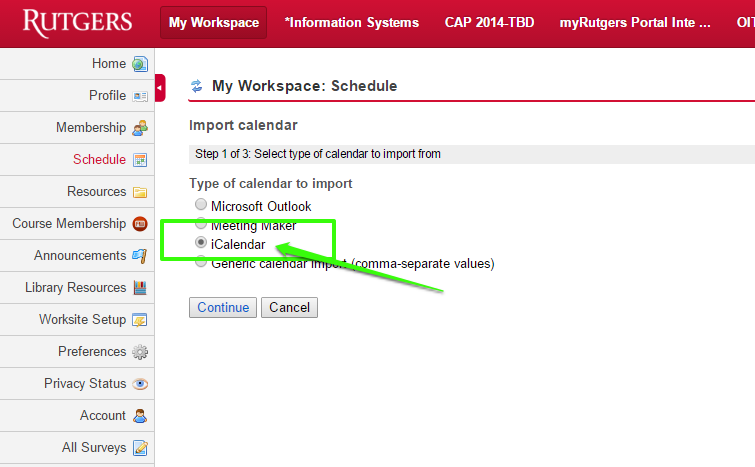 Select the “iCalendar” format and click the “Continue” button. Click “Choose File”, find where you exported the Group Studio “.ics” file, select it and click on “Open” button. Finally, review all the events you are importing and deselect any event you do not wish to import using the checkbox all the way in the right-most column labeled “Import?”. When complete, click the “Import Events” button at the bottom and you’re all done!